It’s been a tough week for terrorists in Syria. Over seven days Russia delivered over a hundred airstrikes at various jihadist facilities across the country, reportedly igniting panic among some groups. The apparent goal of this phase of the operation is to undermine the militants’ capability to keep the pressure on government forces through constant raids and terrorist attacks, and to give the Syrian Army a breathing space to regroup and launch an offensive. 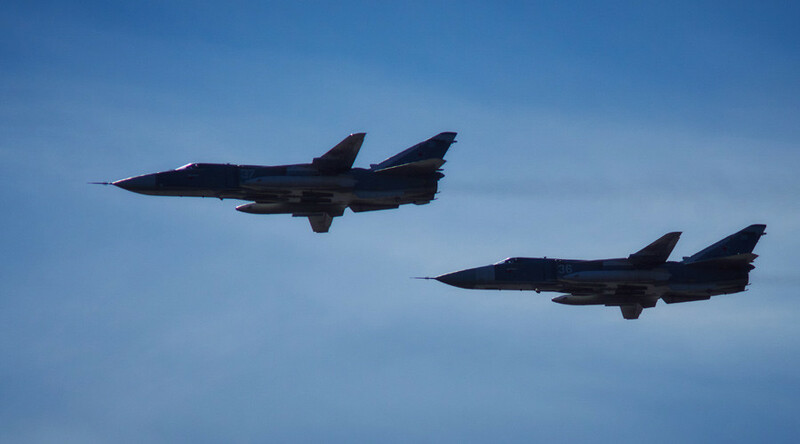 The targets of the Russian airstrikes were spread across Syria, from ISIS stronghold Raqqa in the northeast to the vicinity of the ancient city of Palmyra west of the Damascus-controlled western part of the country to the outskirts of Damascus in the south. According to the Russian military, the bombing campaign has hurt the morale of the militant troops, sending thousands on the run. Russia’s fleet of jets is varied as well. The core of it consists of well-tried workhorses like the Su-24 frontline bomber and the armored Su-25 ground-support fighter jet. Both planes were designed decades ago, although the Air Force brought the latest upgraded versions for the Syrian campaign. Newer planes are also there, like the Su-34, which entered service in Russia last year. The Syrian theater offers Russian engineers a test-field to try the plane, which can hit targets from an altitude of 5,000 feet, far from the range of anti-aircraft weapons in the possession of the militants. The Air Force is employing a number of bombs in the missions, from sophisticated and expensive laser-guided Kh-25Ls and steerable KAB-250s to the bunker-busting BETAB-500s free-falling and affordable FAB-500s. The variety means Russia can strike with pinpoint precision where necessary and bombard with devastating force where no collateral damage would be done. Russia’s Syrian mission flies from a hastily reconstructed airbase south of Latakia. Just a couple of months ago it was an abandoned airfield, but now it sends dozens of sorties daily and hosts not only some of the most high-tech fighter jets on the planet, but also serves as a home for Russian combat pilots, technicians and support troops. Syrian soldiers and officers are at the base to help coordinate the war effort. In addition to the aircraft used for reconnaissance and bombing, the base has plenty of capabilities to defend itself. Mil Mi-24s patrol the vicinity ready to hit any militants intent on firing portable surface-to-air missiles at the Russian planes. Tanks and other armor complete with commando troops are prepared to repel a massive raid. Advanced Pantsir-S1 air defense vehicles and Krasukha-4 electronic warfare systems are covering the airspace – a contingency for third parties attempting to interfere with the Russian operation. The air campaign so far has had the odd glitch. Ankara said Russia invaded its airspace twice over the week. Moscow said it would make corrections to the combat missions to avoid such incidents. NATO officials blasted Russia for “unacceptable violations,” to cite Secretary-General Jens Stoltenberg, but Turkey appears to have allowed such mistakes so far. Of more serious concern are complaints by some western officials that Russia is targeting west-backed rebel troops in Syria and may even end up killing CIA agents in the field. Russia insists that it only targets terrorist troops and demonstrated how the militants use mosques and other civilian objects to protect their weapons from Russian attacks. Such tactics cannot be employed by truly moderate forces, the Russian Defense Ministry noted. Numerous reports of civilian casualties caused by Russia have so far not been corroborated by any trustworthy sources. Footage and photos allegedly proving such allegations were disproven on many occasions as taken even before the campaign was launched. The Defense Ministry meanwhile was unexpectedly forthcoming by providing footage of the strikes and access to the Russian troops stationed in Syria. The military is dropping its old over-cautious stance on secrecy, and is trying to make the campaign as transparent as possible. After a week of fighting ISIS in Syria, Russia is escalating its effort. On Wednesday, the Russian Navy lent a hand to the campaign by firing dozens of cruise missiles from the Caspian Sea at terrorist targets in Syria. And Iraq may soon invite Russia to start attacking ISIS troops on Iraqi soil, stepping up the level of cooperation Baghdad has with Moscow, Damascus and Tehran.